How to work a Stumpwork wired shape. I’m back after what seems like quite a while a way (unfortunately not on holiday) but it has been a very busy summer of teaching so far. Welcome to another How to….. post. This week we are looking at how to work a stumpwork wired shape. What is a wired shape in the first place I hear you ask? Well, a wired shape is a wonderful stumpwork technique which is used to add a real 3D perspective to your embroidery. It is usually a petal of a flower or a leaf and worked on a seperate piece of fabric. It can be filled with long and short, French knots, open Fly stitch and any number of other fillings. 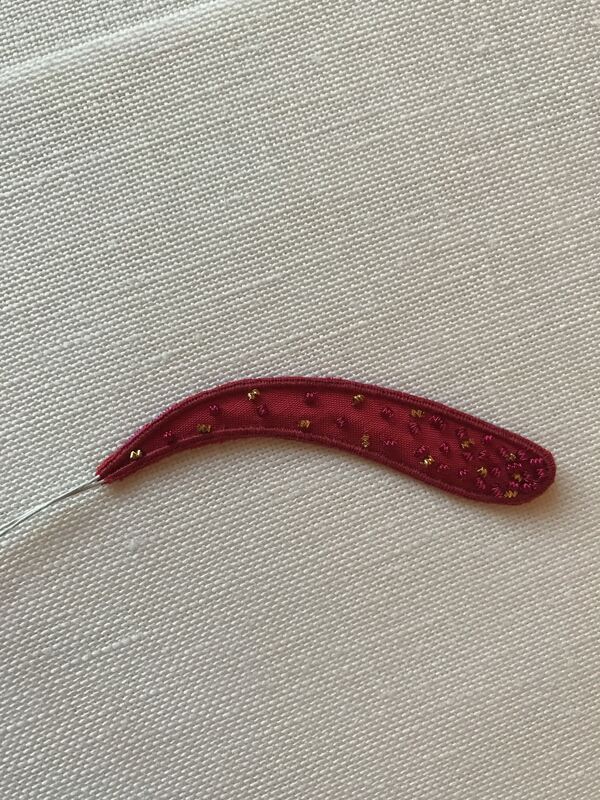 A piece of paper covered wire is then stitched down around the shape of the leaf/petal. Once all the stitching is complete it is then cut out and applied to your main piece of embroidery. I use this technique frequently and it is one of my favourite stumpwork techniques. Paper covered wire. This is available in a variety of different sizes and in white and green. Click here to buy. Gutermann’s sew all thread to match the colour of your sewing thread. Before you can work the wired edge around the shape you intend to cut out make sure you have worked the filling stitch you have chosen, if any. For the images shown I have not worked any filling inside the shape, however my finished piece has chipping worked inside. 1.) With the shape you wish to create drawn onto the fabric and the fabric taut in the embroidery hoop, thread a single strand of Gutermann’s in the colour the finished edge is worked in. This can be matched to the fabric or a contrasting colour, depending on your design. Secure it close to the end of the shape that you are creating, with a knot on the top of the fabric and three small stitches. The knot can then be cut away. 2.) Lay the wire onto the design line, making sure you leave a tail of wire 3-4cm beyond the end of the design line. 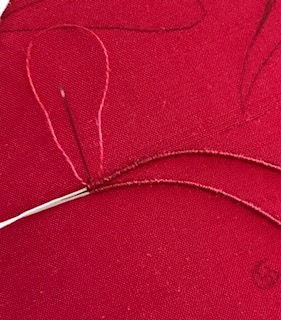 With your needle at the start of the shape bring it up outside of the wire and take your needle back down on the inside of the wire so that you are couching it down. When you bring your needle up and take it down make sure you do so straight. 4.) 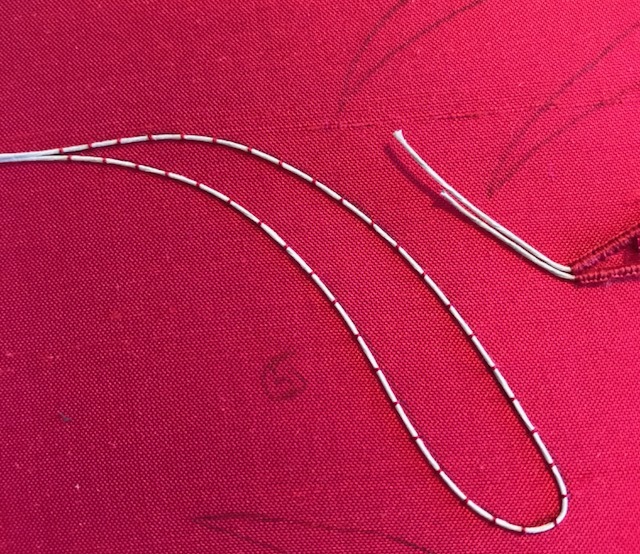 Come back to the outside edge of the wire 3-4mm away from your last stitch. 5.) Take your needle back down on the inside of the wire to create your second stitch. 6.) Continue to work along the length of the wire in the same way. These stitches should sit at 90 degrees to the wire and hold it down securely. When you reach the end, finish off the thread and leave another tail of wire about 3-4cm long. 7.) 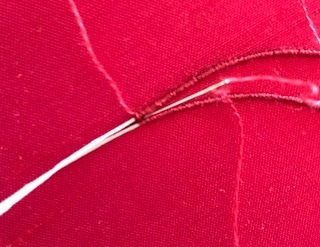 Secure the thread you wish to create the buttonhole stitch with at the start of the wire. I’ve used one strand of stranded cotton. 8.) This time we will be creating exactly the same stitch but there will be no gaps. 9.) 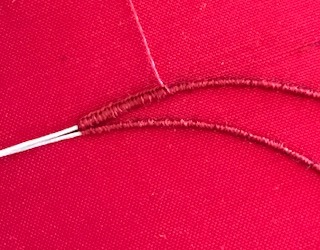 The thread should totally cover the wire and there should also be no overlapping threads which can make the finished edge lumpy. 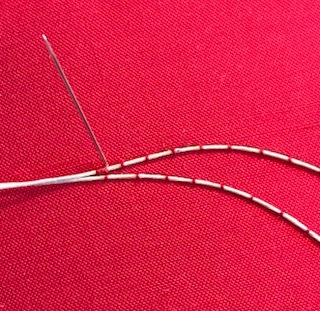 Remember to bring your needle up on the outside, straight and down on the inside, straight. 10.) Now for the final part. 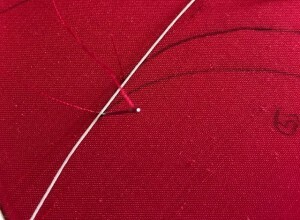 Thread your needle up with the same thread and secure it at the start of the shape. For this you can use one or two strands, depending on how delicate you would like it to look. i have used a single strand. 11.) Bring your needle up on the outside. 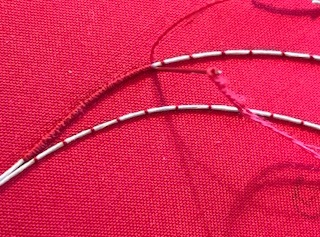 Then take the needle down on the inside parallel with the first stitch. Do not pull the thread all the way through, leave a loop. 12.) Bring your needle up on the outside edge next to (but not using the same hole) the first stitch and take the needle through the loop. 13.) Pull the loop from underneath then the needle up from the top to create your first buttonhole stitch. Doing it in two stages like this helps to prevent wear on the thread. 14.) 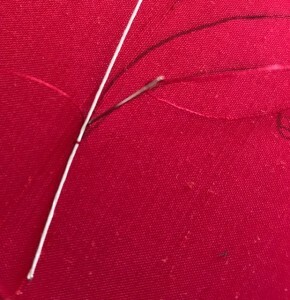 Take your needle down on the inside, again next to the first stitch and make sure you leave a loop. 15.) Bring your needle up on the outside edge of the wire and through the loop. You now have created your second stitch. 16.) Continue around the whole of the shape in this same way, making sure you keep the stitches neat. You will end up with a ridge along the outside of the shape where you have been bringing the needle up through the loop. 17.) 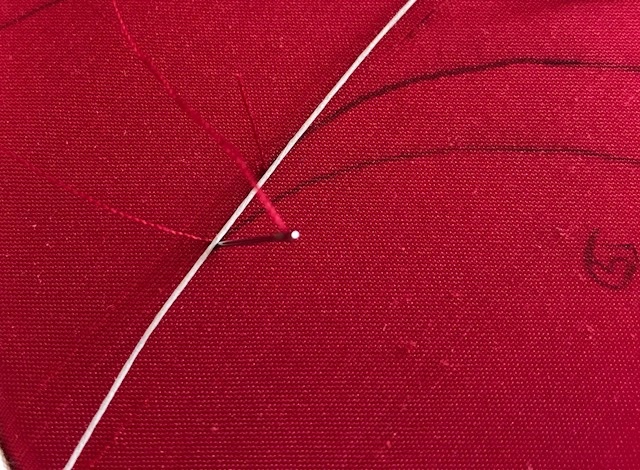 This technique can put a lot of wear on the thread so make sure you keep the thread lengths short and change it frequently. Finishing off the thread needs to be done after it has been pulled through the loop, take the needle down on the outside to hold the loop in place. Finish the thread off. 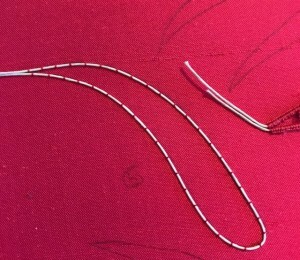 Then when you have started the new thread bring this back through the last loop so that it looks like one stitch. 18.) When all the buttonhole stitch is complete it can then be cut out. 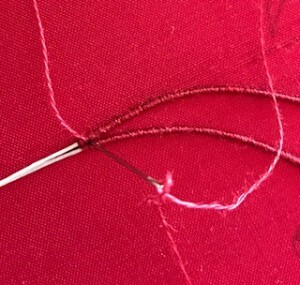 Using a sharp pair of scissors cut as close to the buttonhole edge but with out cutting the stitches. Once you have done that use a needle and run it along the edge of the shape, this will lift up any extra fibres that you will have missed the first time. You can then trim these off. Do not cut the wire, this is used to secure your shape to the base fabric. There you have a lovely wired shape that can then be applied to your main embroidery or as I quite often do, use these shapes to make brooches. 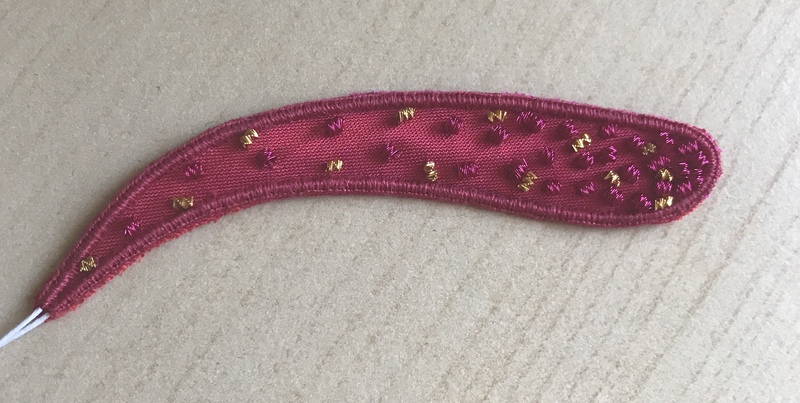 The next post will be on how to apply your wired shape to your main embroidery. As always I hope you have enjoyed this post and feel free to leave any comments or questions below. Hi, can’t wait to see the final flamingo , to say noth8ng of having a go myself! Hopefully you won’t have to wait too long, hoping to finish this weekend. Exciting…love the new gold work head on instagram!